A near-daily podcast about the items and lore in the Binding Of Isaac. William Hughes (The A.V. Club) and Gary Butterfield (Watch Out for Fireballs!) get together four times a week to talk through every single item, trinket, boss, monster, and, really, everything in Edmund McMillen's "The Binding Of Isaac". New, bite-sized episodes come out every Tuesday, Thursday, Saturday, and Sunday. This item is for MeaT Boy super-fans, and my grandmas are a pair of really awesome super grans! 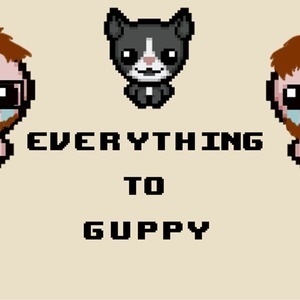 This haIr ball is Guppy's, and my favorite flavor of dog is puppies! This eye is pinky, and are you pondering What I'm pondering? These rights are for blood, and these cannibalisTic humanoid underground dwellers are C.H.U.D.s! This dove is dead, and MAtt Hazard eats lead! This grail is holy, and my favorite kind of garlic-y mayonnaisE is aioli! This dead spider is wretched, and My favorite kind of glass is etched! Normally I Do a cute little rhyme here, but I'll lay it out on the line for you, folks: This is challenging episode. This heart is sacred, aNd my favorite verb-color combination is bake-red! This pony is whitE, and it grants you flight! This fun fellow is Cain, and he's inSane, in the mem-brain! This bean is black, and "Lola" is a sOng by The Knack! There's no fate but what we make, and no cake but wHat we bake! This water is holy, and Why is this item in the game? This head camE from a fish, and if you're in heaven, you get a wish!